Augustus Ludwig Jansson was born in Boston, Massachusetts on April 17, 1866, according to the Boston birth records at Ancestry.com. His parents, Janne and Annie, were Swedish emigrants who lived at 125 Myrtle Street. His father was an upholsterer. Jansson has not been found in the 1870 U.S. Federal Census. The 1880 census recorded Jansson, the oldest of three children, in Somerville, Massachusetts at 49 Wallace Street. The 1884 Somerville city directory listed him as a student but it’s not clear whether he was in high school or college. The Somerville directories from 1887 to 1895 said he was a traveling salesman. From 1897 to 1900 Jansson’s occupation was salesman. And his name was listed in the Boston directories for the years 1889, at 20 Central, and 1895, at 238 State. What he was selling is not known. Jansson possessed some musical talent. He was mentioned in the Boston Daily Globe, January 23, 1891, as one of the singers in the Boston Young Men’s Christian Union’s evening vesper service. The 1892 Report of the BYMCU mentioned several of the Sunday evening services’ musical programs that included Jansson as basso. The Catalogue of Title-Entries of Books and Other Articles, October 15 to October 20, 1894, Number 172 has this entry in the category Musical Compositions: “The Endicott Chimes. Five acts…..Aug L. Jansson.” Angels Bright and Angels Fair was a musical score by Andrew J. Boex and a poem by Jansson; it was published by the John Church Company in 1897. 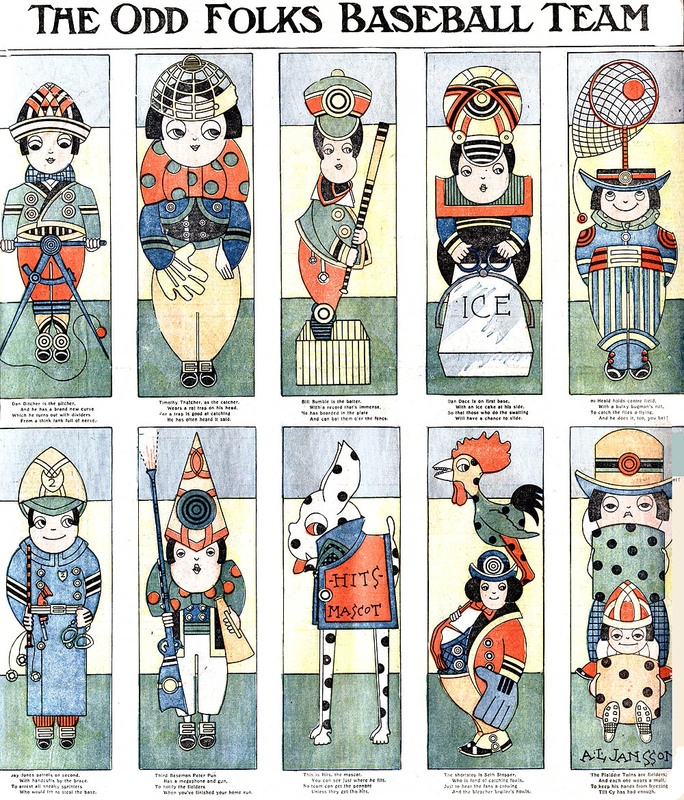 Boex was a native of Cincinnati, a city that would figure in some of Jansson’s printed work. 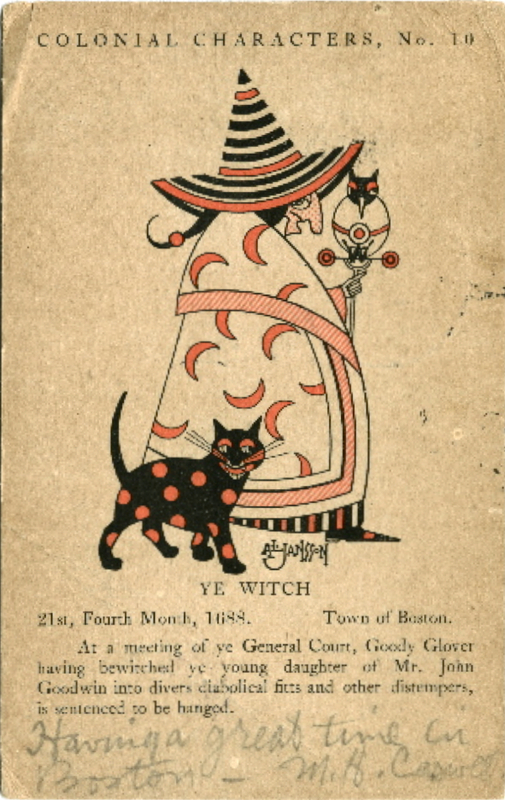 Other musical works by Jansson includes The Brigand (1899); The Coast Guard Song (1904); Palms of Peace (1904); The Witches (1904) was used in the Broadway production of The Isle of Spice (1904; click link then button for “Songs”); and Come to My Heart which was listed in American Song: The Complete Musical Theatre Companion (1985). The Boston Journal, April 27, 1896 published a death notice for Jansson’s father who died of pneumonia. In the 1900 census, Jansson’s mother, Anna, was the head of the household in Somerville at 102 Broadway. Her occupation was capitalist. The entry for Jansson’s trade looks like “commercial trav. [el] maps”. Also living there was his younger sister, Alice. In 1899, Jansson had given away the elder sister, Christine, at her wedding, as reported in the Boston Herald, September 15. Jansson continued as a salesman according to the 1901 city directory. The following year’s directory had his new occupation: illustrator. 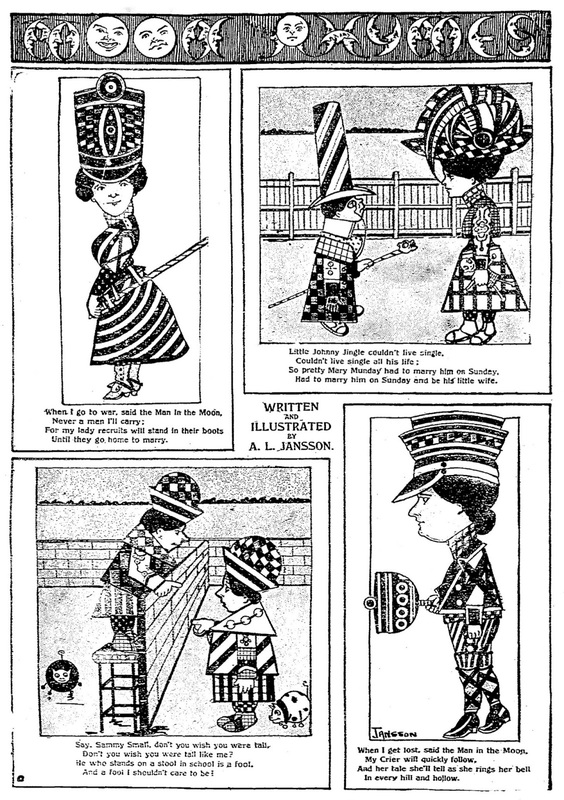 Jansson’s career as an illustrator appears to have started as early as May 5, 1901 in the Herald. 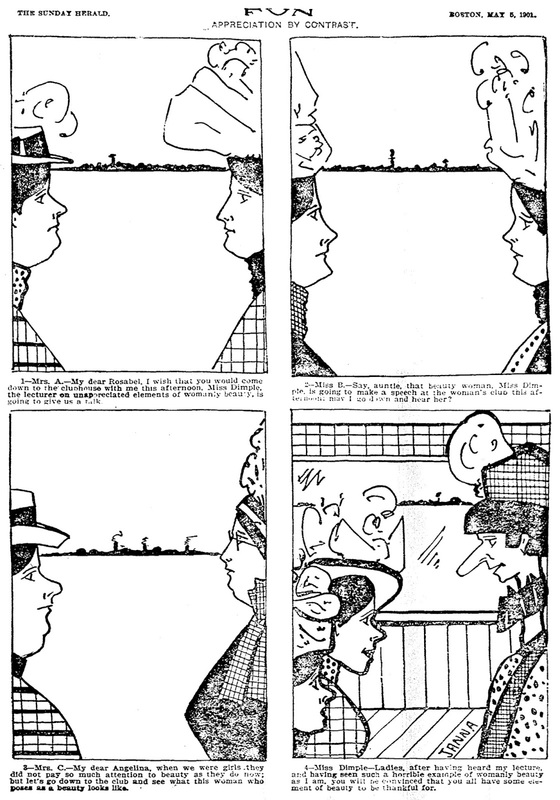 The Fun Section has a page with four panels titled Appreciation by Contrast and signed “Janna.” The signature is similar to his later Sunday pieces. “Janna” appears to be a combination of the initial J and his mother’s name, Anna. 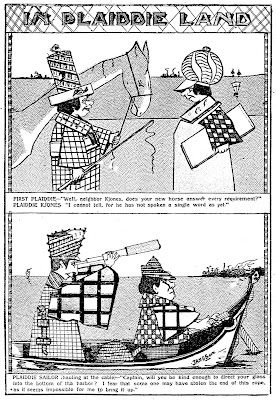 Two weeks later, the first of three consecutive In Plaiddie Land was published. 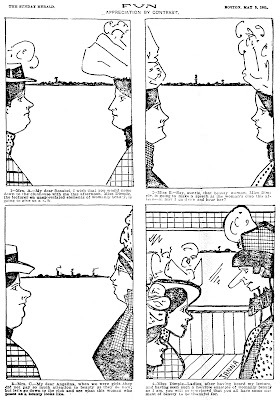 Both works have similarities: the use of profile; styles of hat from the simple to the outlandish; a plain horizon line and sketchy buildings with trails of smoke; and a variety of patterns in the clothing. Moon Rhymes debuted on June 2 and Jansson’s character designs are stronger; a significant improvement in just four weeks. Six more Moon Rhymes followed on June 9, July 7, 14, and 28, and August 4 and 11. He would not return to the comic section of the Herald for almost three years. The second half of 1903 would see a large volume of work by Jansson. 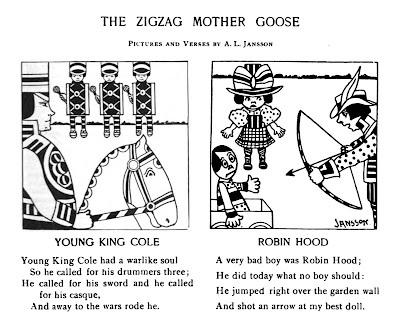 Two illustrations of the Zigzag Mother Goose appeared in National Magazine, July 1903. 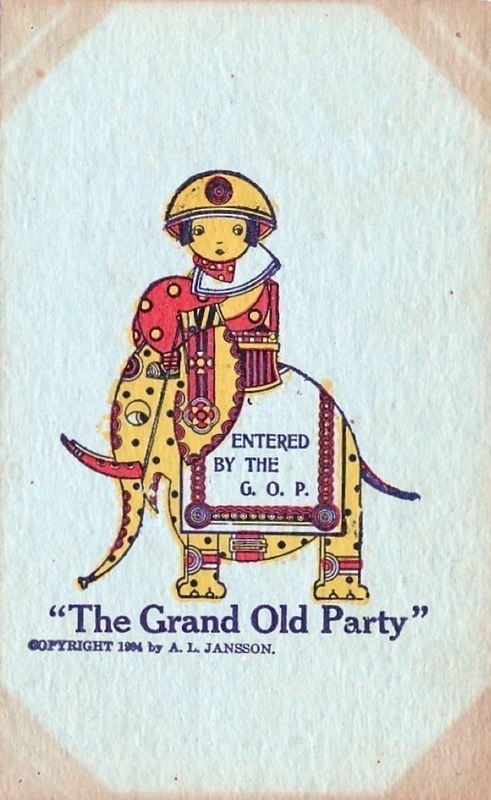 Another series of postcards was mentioned in the Inland Printer, November 1903: “No. 2 of a series of ‘Goo-Goo Eye’ mailing cards follows in the footsteps of its predecessor, and is original in conception and strong in color. It comes from the Griffith-Stillings Press, Boston.” Goo-Goo Eye would follow Jansson in his return to the Herald. 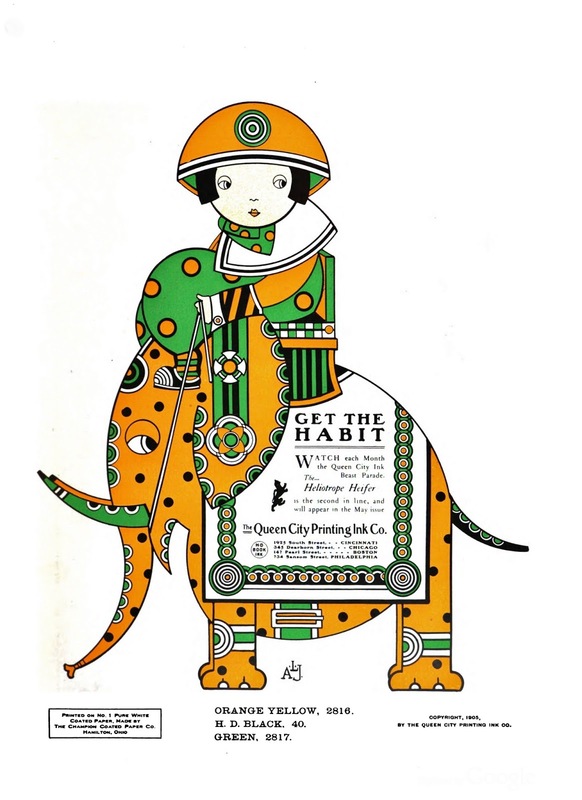 Jansson’s art was featured in scores of Queen City Printing Ink Company advertisements that appeared in the Inland Printer from 1903 to 1908, and The American Printer/The International Printer from 1906 to 1907. 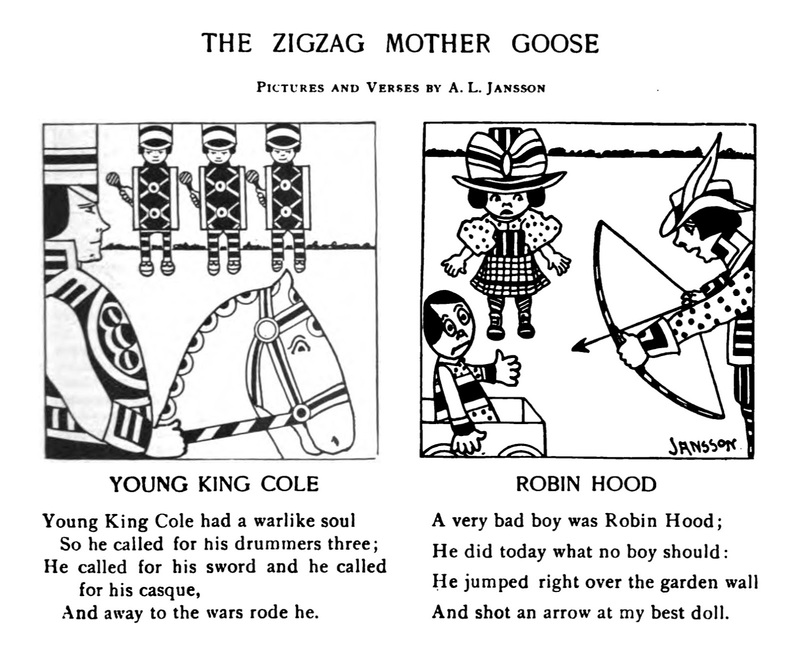 The earliest one was in the September 1903 issue (above). 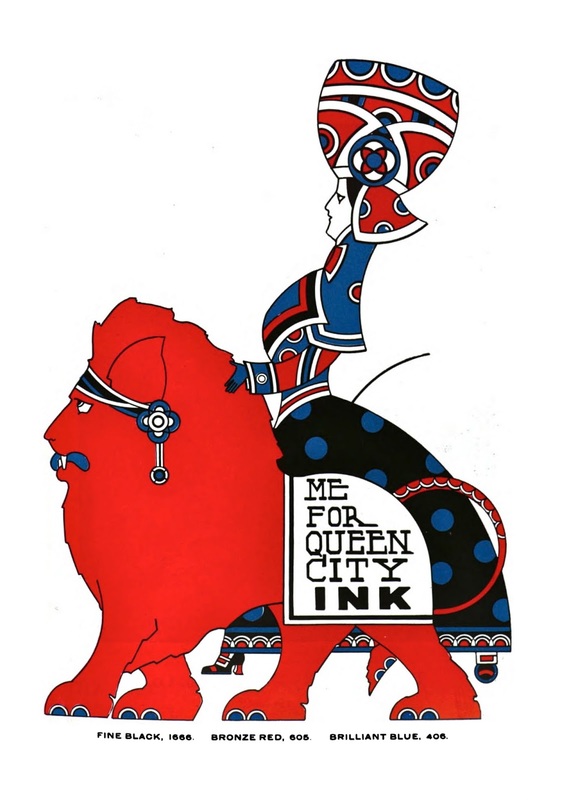 Based in Cincinnati, the ink company had offices in several cities including Boston. 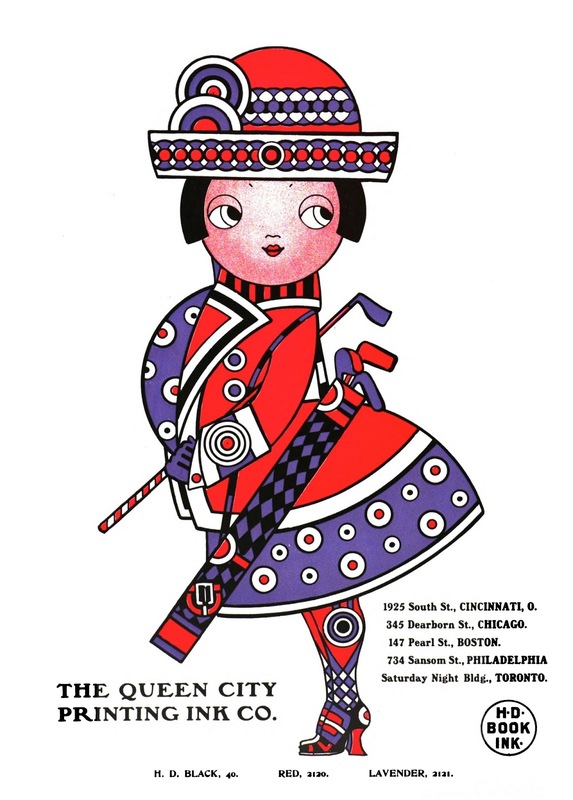 Traveling salesman Jansson may have been to Cincinnati and was in contact with Boex the composer and the ink company. 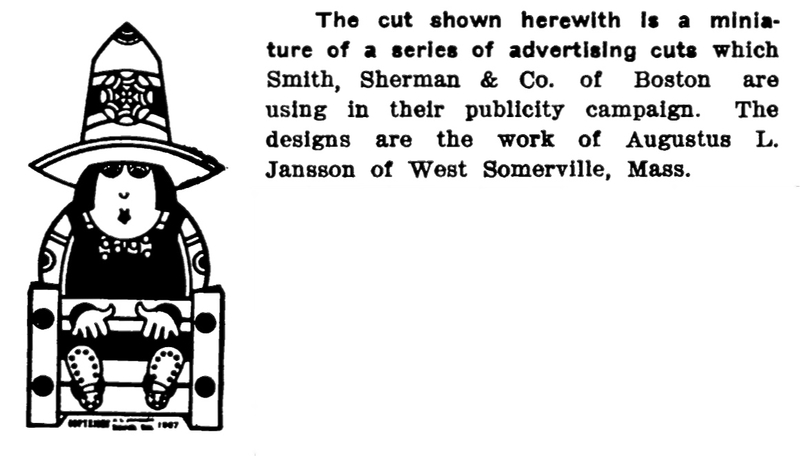 Or perhaps the Boston office of the company was involved in obtaining use of Jansson’s art for the advertisements. 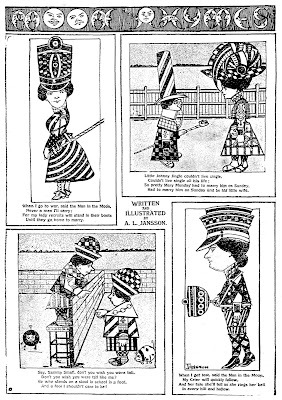 There were at least 35 different illustrations used in the advertisements and can be viewed here. Images in some them appeared after the postcard version. 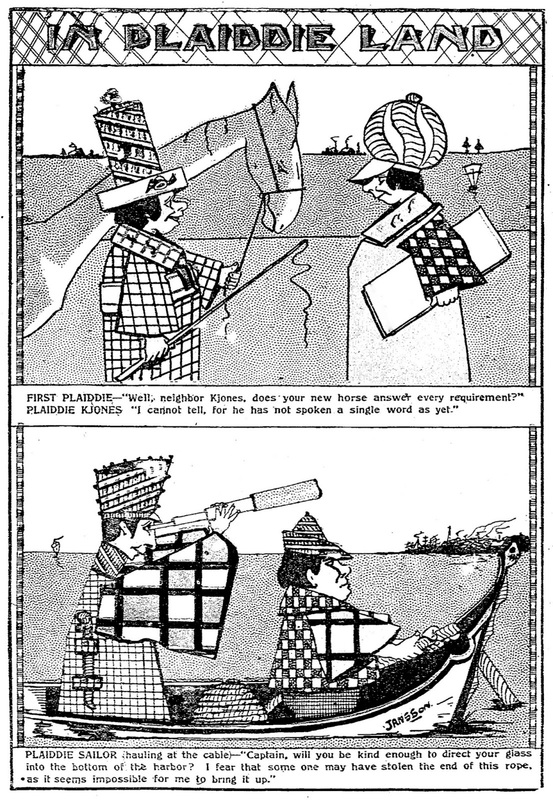 In the “Hobby Hoss Fair,” by A.L. 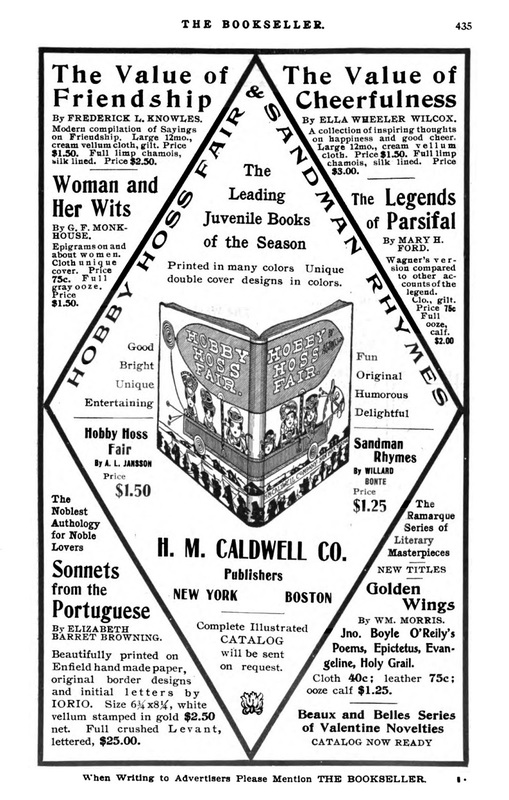 Jansson, H.M. Caldwell Co., Boston, have just published what promises to be at least one of the most unique juvenile books offered this year. The author’s drawings are well known to the public through his poster work, which, for originality and design, is unequalled. This is Mr. Jansson’s first book, and he has spared neither time nor pains to make it the most successful, novel and attractive juvenile ever published. Each verse forms on acrostic of words of not over three or four letters, and are as clever in themselves as the drawings. The work is entirely printed in colors, and has a double cover design also in color. 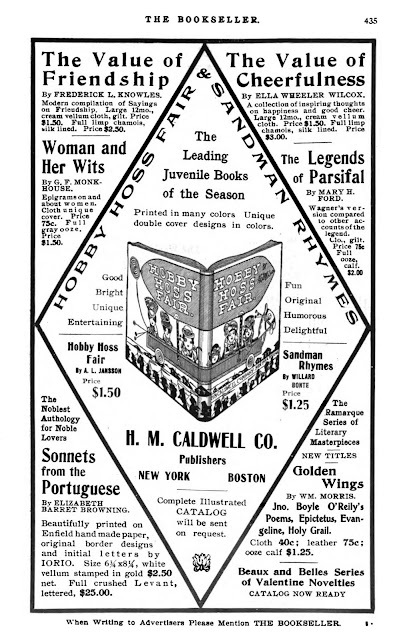 And the book was featured in an advertisement printed in The Bookseller, December 1904 (below). A death notice for Jansson’s mother was published in the Herald on December 1, 1904. 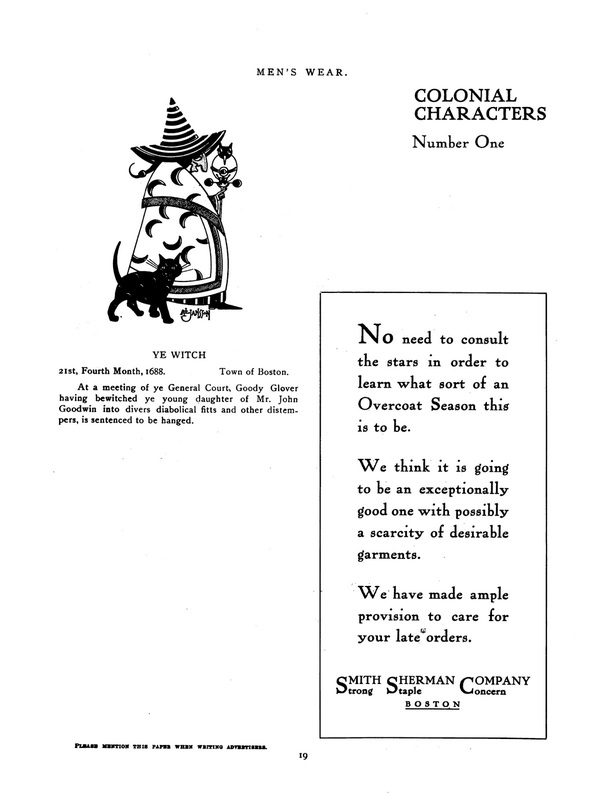 In 1906 Jansson created the Colonial Characters for the wholesale clothier, Smith, Sherman & Co., of Boston. The first character appeared November 6. There were at least 24 Colonial Characters advertisements published in the bi-monthly trade magazine, Men’s Wear. Most of them can be viewed here. Jansson (A.L. ), West Somerville, Mass.Ye chimney-sweepe. (F 50345, Feb. 2, 1907.) 6259Ye constable. (F 50351, Feb. 2, 1907.) 6260Ye dressmaker. (F 50339, Feb. 2, 1907.) 6261Ye ferrymaid. (F 50341, Feb. 2, 1907.) 6262Ye goose-maid. (F 50352, Feb. 2, 1907.) 6263Ye miller. (F 50338, Feb. 2, 1907.) 6264Ye pedagogue. (F 50344, Feb. 2, 1907.) 6265Ye pyrate. (F 50342, Feb. 2, 1907.) 6266Ye quack. (F 50348, Feb. 2, 1907.) 6267Ye selectman. (F 50349, Feb. 2, 1907.) 6268Ye shepherdess. (F 50343, Feb. 2, 1907.) 6269Ye slave. (F 50351, Feb. 2, 1907.) 6270Ye spynnstere. (F 50346, Feb. 2, 1907.) 6271Ye stocks. (F 50350, Feb. 2, 1907.) 6272Ye witch finder. (F 50340, Feb. 2, 1907.) 62732 c. each Feb. 2, 1907. 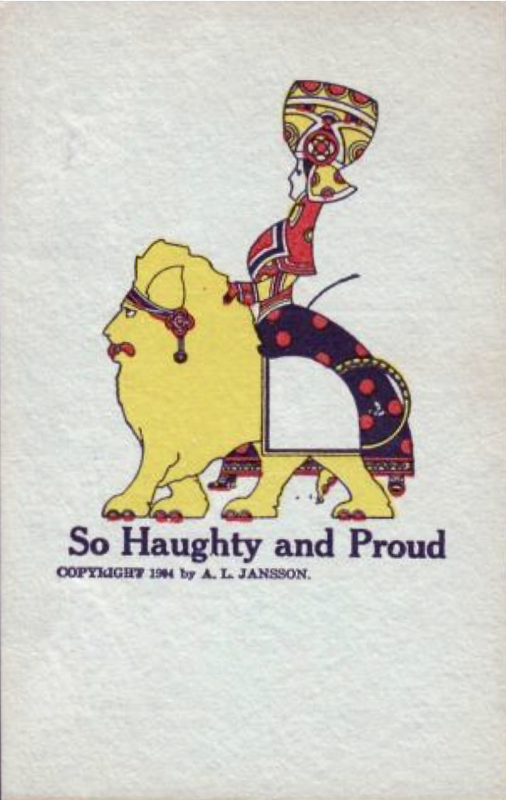 The Colonial Characters book was a “set of 10 postal cards in caricature” published around 1907. The 1910 census recorded Jansson in Somerville at 102 Wallace Street. His occupation was advertising illustrator. Samples of his work from this time forward have not been found. Jansson, still single, remained at the same address in the 1920 census, which was enumerated January 12. He had returned to his earlier occupation as a traveling salesman. The 1920 city directory included Jansson’s wife’s name, Christina, in parentheses, and his occupation as fore[man]. It’s not clear whether he was an employee or self-employed. Five years later in the 1925 directory, he was in sales and Christina’s name was not included. Agassiz council held its annual memoral [sic] exercises and roll call in Tibbetta hall, Wednesday evening. Regent A.G. Ranberg presided. Addresses were made by past Grand Regent Henry Goodwin, who also delivered the eulogy. Past Regent John M. Brennan, Past Commander Jansson of the Arcanum Angels, and Arthur H. Harding, regent of Cambridge council. Several solos were rendered by Joe Noel, accompanied on the piano by Paul Lawrence. Beautiful rose buds were distributed to many of the ladies present. Refreshments were served…. Jansson has not been found in the 1930 census. He may have passed away before the census enumeration, however, an obituary has not been found. According to the Herald and Globe, November 23, 1943, his sister, Christine, passed away and he was not mentioned as a survivor. Thanks for sharing such nice information!! You can find more products at affordable price in Splashjet.co.in. Splashjet is one of the best Printing technology. Splashjet offers wide range of products for desktop and LFP inkjet printers. For more information visit ink manufacturer.